The SP edition of the venerable Nitecore EX10 is really a collection of updates to the original that end up changing the entire feel of the light. Though visually barely different, the resulting new UI and LED change have really shaken some things up. Nitecore has now begun to expand their EZ series of lights with new power options including this model utilizing the minuscule CR2 cell. This series drops the standard programmable, feature-rich user interfaces that Nitecore is known for in favor of a simple 2 stage light that requires no complex learning curve to operate. Nitecore has now begun to expand their EZ series of lights with new power options including this model utilizing the venerable CR123A cell. This series drops the standard programmable, feature-rich user interfaces that Nitecore is known for in favor of a simple 2 stage light that requires no complex learning curve to operate. NOTICE: On 4/11/2009 Nitecore has announced that they are issuing a recall of all Nitecore EZ AA lights. Please click HERE for my impressions of the revised “Ver: 1.1” product. 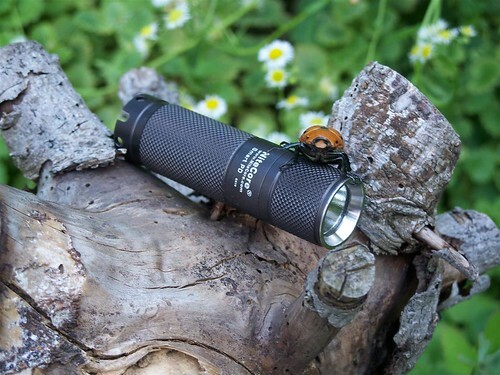 The Nitecore EZ AA is the first light in the newly introduced EZ series of lights by Nitecore. This series drops the standard programmable, feature-rich user interfaces that Nitecore is known for in favor of a simple 2 stage light that requires no complex learning curve to operate.